Excited to get this new tent, can't wait to try it out. Found it on the Wmart website for $35 shipped to the local store. I left it set up in the back yard for a week and it never moved or loosened up. It will need a mosquito net and I have one of those. This was very fast and easy to setup and it's pretty light at about 3 lbs and packs up pretty small. Lots of room for two people to sit up in plus gear or one person to lay down plus gear. I have always liked the traditional A frame style tents, but now that I'm old and fat, I just don't like loading myself through the end- rolling in from the side makes this one a breeze. A note on build quality: All seams are taped on the inside, the tent poles and stakes are of good quality and the zipper works better than I expected. I like that tent! Thanks for the link, I ordered one. I was looking for a tent for the truck and that looks to be the perfect size for what I wanted. (01-30-2018, 12:40 PM)bmyers Wrote: I like that tent! Thanks for the link, I ordered one. I was looking for a tent for the truck and that looks to be the perfect size for what I wanted. I did put seam sealer on the outside of the threads and spray it down with the Scotch guard water sealer just to be sure. 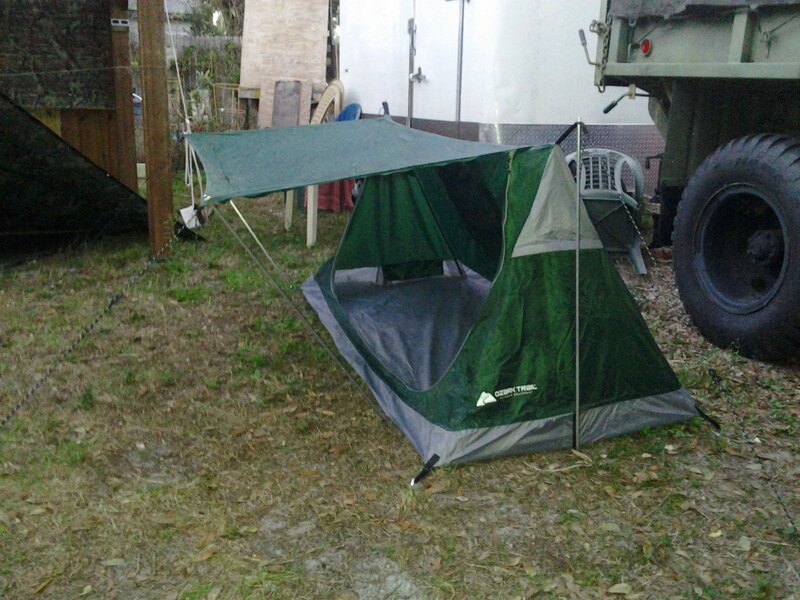 I will also use the Wmart blue 5x7 hiking tarp for the footprint. This is great. I saw a very similar tent on the Sportsman's Guide. But it was sold out indefinitely. JRSC-- ordered mine on E-bay Wed Morning. Nice looking and good specs. We'll see at SEP #19. Gene you started a trend. 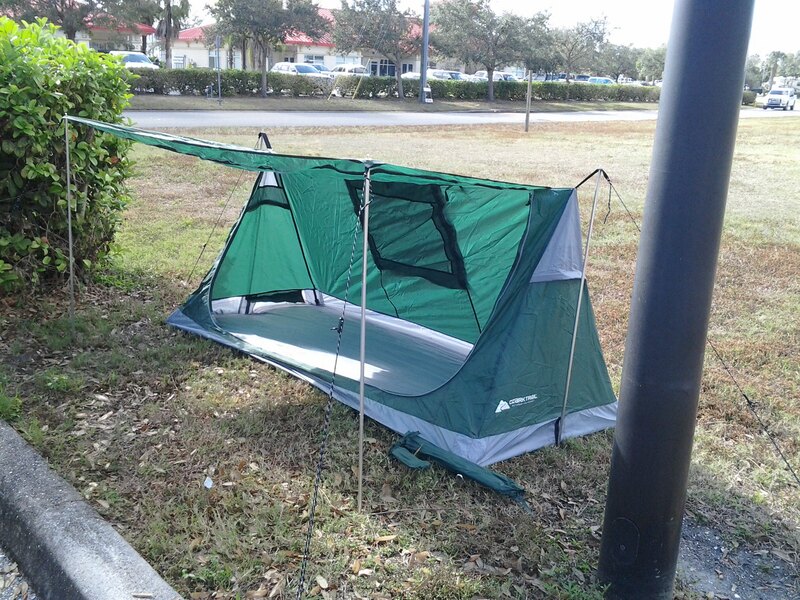 The only thing that would perfect this tent is if it had a mosquito net you can put across the opening. 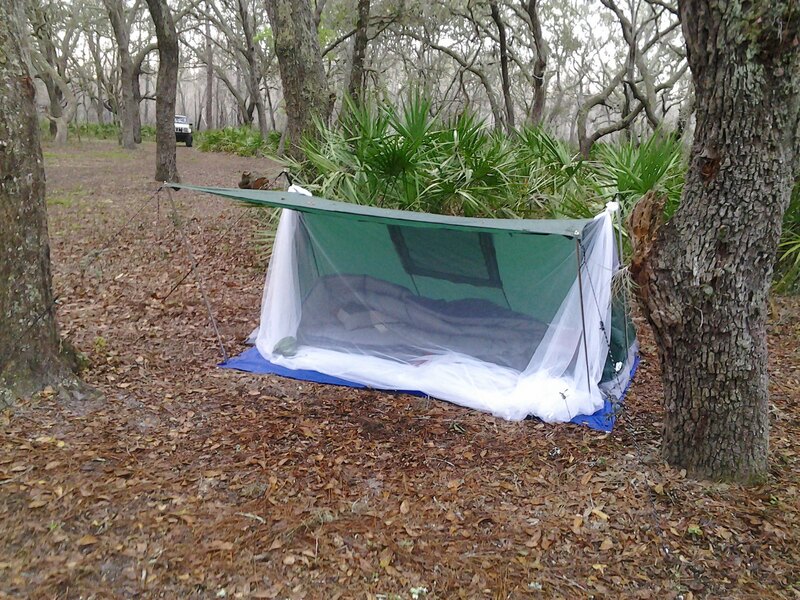 "The only thing that would perfect this tent is if it had a mosquito net you can put across the opening." This screen is very light weight and inexpensive. It worked! Camped in this at the SEP gathering #19, it rained during the night and I stayed warm and dry. I would sleep in this tent again. The open concept option was very nice and the weather was perfect for this. I suppose to be fair I should sleep in this with the side closed but I have had this shape tents before and already know how that feels. The 9 dollar Wmart bug net was just tied on in two spots and because of the angle to the top, it stayed closed to the bugs. I used my shoes to move the base out for a more roomier feel. The 9 dollar Wmart hikers tarp and a couple of extra wire tent stakes worked perfect for the footprint and gave me a little porch to put my stuff. Can you see where I'm going with this? It was an inexpensive camping trip= you don't need to blow lots of money to have fun. Jeff took his hooch down before I could get pictures but his bug net setup was very well thought out and integrated into his tent. I am going to try and duplicate his setup before I use this tent again. .Ok, as of 8/16 (when I checked) the OT Bivy Tent from wmart is on sale again this time for $21 bucks with free shipping if your order is over $35. So I bought another plus a movie and will be picking these up at my local mart in 2 days.